I'm not a native speaker, so I don't know what's easier to understand... :-( The term "icon" is used quite often already throughout KDE AFAIK, so if this is really a problem we'd have to fix this everywhere in my opinion. "File symbol" is vague, "icon" is a precise and very common word, so IMHO the current naming is the right one. IMHO it is a big mistake to replace precise technical terms with vague ones. Programs will tend to use different vague terms, so it's bad for consistency, and some are really too vague to be understandable. I'm wondering why do you wait for Monday. Does it introduce changes in the API? If not, there is no need to wait. > is no need to wait. No API changes are done for this, but I've done another API addition yesterday which touches some Dolphin files and I don't want to risk that I accidentally commit a wrong file. What about the multi-column view that we have had in konqueror for years? 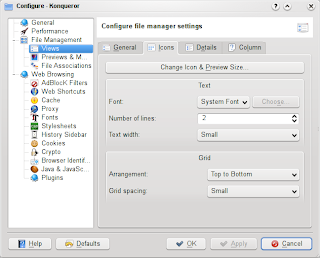 Is there a reason why it's gone away in KDE4? I found it very useful, and I think many people liked it too. @Dijkstra: a column view in Dolphin is already available. Which kind of "multicolumn view" do you mean? If you mean the treeview: this will be available in the KDE 4.1 version of Dolphin. @Dijkstra [Update]: I just checked on the KDE 3 version of Konqueror what you mean with "multicolumn-view". This is available in Dolphin already: Just configure the alignment of the icons view from "Top to Bottom" to "Left to Right" in the settings dialog. Wow! I found the option, and it's exactly what I meant. Not as intuitive as in konqueror3, but I find it a very elegant solution. With this and the tabs, I'm now officially a Dolphin user. Thank you!